The Brand New Home Screen! The new version of MyStats is almost ready and will be released soon! Let's take a look at the new features! You can specify the start and the end date of the graph time periods for both Pie Charts and Line Graphs. Now, let's walk through how it works. 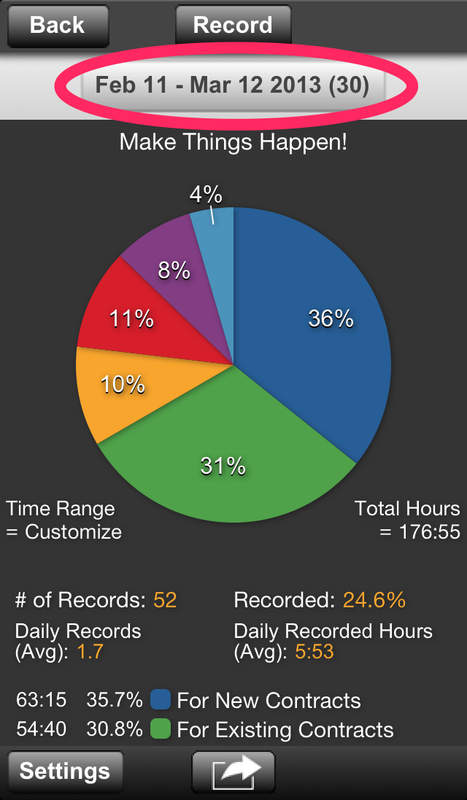 Select "Customize Time" fond in "Settings" of the Pie Graph page. Notice that the Time range is now changed to "Customize" on the Pie Graph. Tap on the date button. Select your preferred time period. The Pie Graph is now reloaded in accordance to your selected period of time. You can also change the time period for the Line graph. The time period's max length for the Pie Graph is 31 days and 365 days for the Line Graph. The cumulated value (shown when the Data Process Type is set to Cumulative) is now always available for the Line Graph. We hope that some of you will find this to be useful. 3. Switching the Home screen animation. The home screen was re-designed and animation was introduced from V1.40. Though the animation looks good, in some cases, it affected the system's performance. Now you can select the animation off option for the home screen. Try this setting if you feel the home screen is too busy. By the way, you don't need to wait for the animation to end if you want to move to another screen. You can access the time line if you tap the Digital Clock during the animation. Bird's-Eye view is not displayed on the home screen if you use the 3.5 inch display device. The menu has been changed so that you can access Bird's-Eye View easily. Let's swipe the home screen to show the hidden menu. You will find Bird's-Eye View button on the top layer of the menu. The home screen has been redesigned for Daily Activity users. If you haven't recorded TImed Activity in the last 31 days, the MyStats logo will appear where the Pie Graph and Bird's-Eye view are displayed as usual. This logo is the background image and will not respond to any action. Though many of these are very small changes, we hope that this will make MyStats more useful! The home screen of MyStats has been fully re-designed. It's been almost two years since the first version of MyStats was released. We've been trying to keep MyStats as simple as possible. However, we have to admit that because of a lot of new functions we added to MyStats, it had become a little bit complicated. We also think that the design of the home screen from two years ago was not very "up-to-date". So, we are now proud to introduce the brand new home screen! - A quick look of your current data and status. - Easy access to other screens. The other feature of the new screen is the hidden menu which slides out when you swipe the home screen. You can find Backup & Restore, Email CSV Data, Facebook, General Settings and all other functions here. Don't you think that the new home screen makes your MyStats life better?